Originally called "Too’s Marshes" the Tue Marshes Lighthouse was built in 1875 at the entrance to the York River on the Goodwin Islands. It was a square screwpile lighthouse and was built at a cost of $15,000. It had two additional fender piles, one on each of the ebb and flow sides of the structure for additional stability against ice flows. In the late 1890s, the spelling of the name was changed to "Tue’s Marshes." 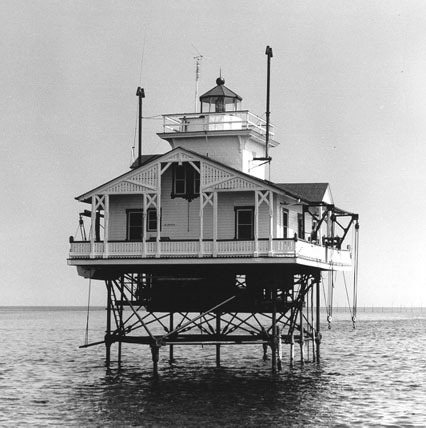 The lighthouse was dismantled in 1960 and replaced with a steel skeletal tower built on the original foundation.